said Beth Savan, Ph.D. MCIP Senior Lecturer Emeritus, School of the Environment, and Research Associate, Cities Centre with the University of Toronto; Senior Fellow, Massey College. Professor Savan presented her latest 2-year research project on methods for tapping into latent demand for cycling and the impact and potential of cycling economies within GTA communities at the Western GTA Summit and the LIVE Taskforce Speaker Series in the boardroom of DTZ in Mississauga on June 9, 2014. 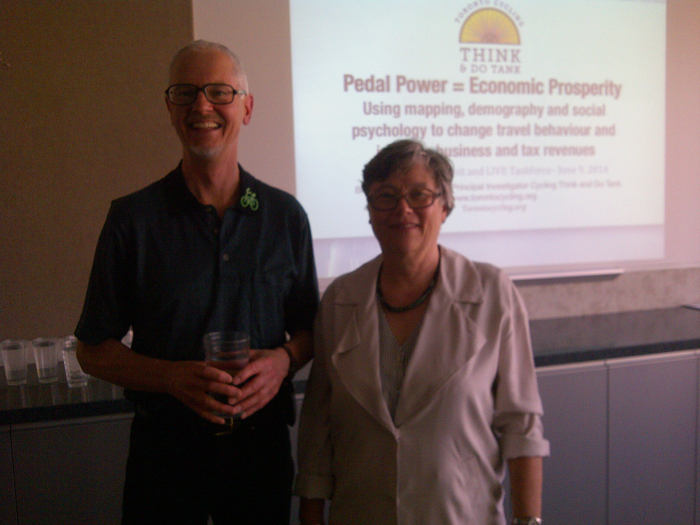 Beth and her team of researchers at Toronto Cycling Think & Do Tank made several interesting and perhaps surprising conclusions using mapping, demography and social psychology to change travel behaviour and increase business and tax revenues in Toronto. The City of Toronto now rivals any city in North America for cycling. Using excellent research data from her own project and reporting on research from around North America, Beth amply supported her statements. Some Toronto merchants are actually trying to attract cyclists now. Citing specific local examples, Professor Savan presented research findings to a group of merchants on Eglington Avenue who were previously opposed to separated bike lanes in both directions. After the discussion, the merchants reversed their position! Good decisions require hard research data rather than stereotypes of cyclists and myths surrounding the value of cycling. In East Village New York, cyclists spend the highest per capita amount on retail of all the transportation modes, even higher than pedestrians! Increased cycling resulted in a “dramatic decrease in commercial vacancies”. This pleases residents wanting a vibrant community, retailers wanting shoppers and the city wanting a healthy tax base. Professor Savan reported that between 2006 and 2011 in Toronto, cycling for transportation increased by 63% while auto use decreased 4% and transit was up 8%. 7.5% of the commuters entering the city for work travelled on bicycles, according to their 2013 research. Cycling rates are much higher in some areas of the city and numbers of cyclers are likely underreported. This research could be applied to the downtown core of Brampton with its increasing density both east-west along Queen Street and north-south along Main Street. 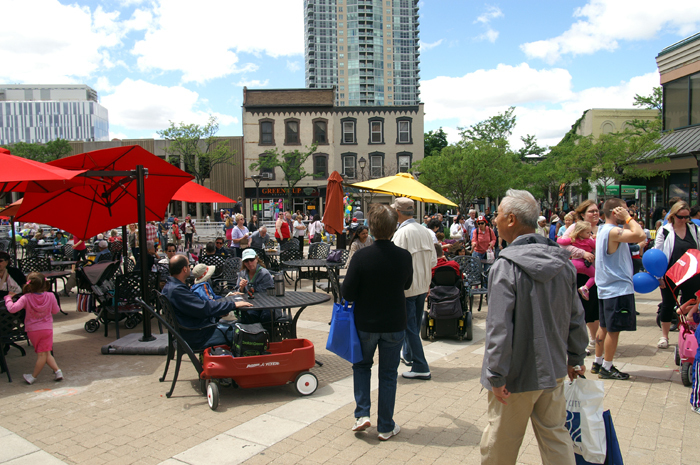 The redevelopment of the downtown core for residential and commercial with new public spaces such as Garden Square adjacent to the Rose Theatre makes this a natural location for application of this research information. said Professor Savan about their research findings. Congestion and lower speed limits actually favour cycling. Beth reported that 2/3 of the cycling trips are taken by men. But when cycling density is higher, the cycling rate of women rises to 50%. Once cycling is legitimized in an area, women start to ride. “The more cyclists you have, the safer it is to be a cyclist.” Fear is one of the barriers that needs to be removed. This link to behavioural psychology was a fascinating result of Professor Savan’s research which we can apply to Brampton due to our large immigrant population. When a new resident arrives, there exists an opportunity to introduce positive cycling behaviour! Beth presented their Cycling Adoption Toolkit for translating the theory into practice. Cycling can be linked to social events: for example, Celebrampton’s Bike Fest. Cycling can be promoted on social media Facebook, Twitter and PlusGoogle. Local mentorship is a also valuable tool, as is a method to track success. The expansion of Sheridan College in Brampton presents another opportunity for promoting greater economic benefits of cycling for local businesses. Western GTA LIVE Taskforce Chair Peter Van Sickle was clearly excited by the possibilities, as was many of the seminar participants who peppered Professor Savan with questions about implementing the research. Professor Savan’s research has provided much that we can implement for the benefit of our community.